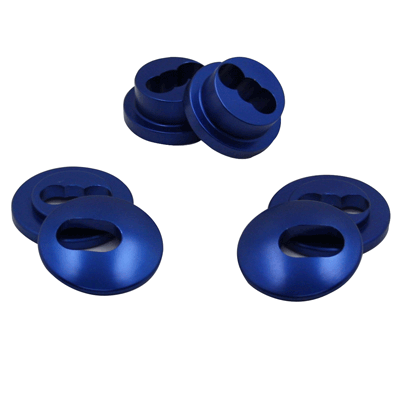 Replace the stock rubber or aftermarket urethane bushings with these Maximum Billet Rack Bushing Kit. Designed to work with the 96-04 Maximum Motorsports Tubular K-member. These bushings allow for five mounting positions. 1996 1997 1998 1999 2000 2001 2002 2003 V6 V8 GT LX Cobra Mustang Steeda Roush & Saleen Vehicles. No one else can stack up to the bold clean styling of our aftermarket Billet dress ups, Street Strip & Racing Suspension & Performance Parts for your late model American Muscle Car!